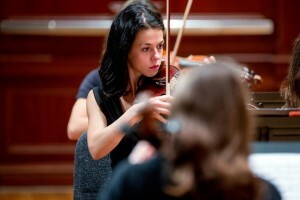 Therese DeGenova ’17 performs during a TCNJ Orchestra concert. As one of the orchestra’s violinists, DeGenova will perform a full symphony concert each week with the other participants, in addition to participating in smaller ensembles. It will be DeGenova’s responsibility to independently teach herself the music for the program prior to arriving in June. As a first-time music festival participant, DeGenova says that she is honored to part of such a respected program. “I hope not only to gain first-hand experience with standard orchestral literature, but to also learn independence as a musician,” said DeGenova. DeGenova has impressed TCNJ music faculty with her tenacity and commitment to music performance. “Therese is an outstanding student, a tireless worker, and her acceptance into this program is the result of her dedication to her studies,” said Uli Speth, Professor of Violin at TCNJ. DeGenova says it was Speth’s encouragement that propelled her to apply to Pierre Monteux, and without his training and support, she would not have pursued this opportunity. “I cannot emphasize enough how crucial it is to have a teacher as supportive and motivating as Uli is,” said DeGenova. Pierre Monteux was founded and named after world-renowned conductor Pierre Monteux in 1943. The school attracts musicians from across the country and around the world, and its distinguished alumni include several well-known contemporary conductors, including Andre Previn, Lorin Maazel, and Sir Neville Marriner.